A really good space explosion is a multi-stage affair. First, arced lightning ripples between the ship’s components like electrical storms on the planets it’ll never land on again. Then a white-yellow blast pushes its way out from the vessel’s core, followed by another, and another. There’s a sickening pause while vital parts leak out into the void, before red, white and blue fireworks shoot in all directions, leaving a disintegrating, blackened husk in their wake. That’s how it’ll happen in Star Citizen, anyway. Need a bit of space? These are the best space games on PC. Around the Verse talked to Cloud Imperium senior technical artist Matthew Intrieri, who described his work and that of senior VFX artist Sean Ellis – who was previously responsible for all of the particle and special effects in Crysis. And of course, there’ll be exploding inside the vessels too, thanks to Star Citizen’s multi-crew ships. Did you know? 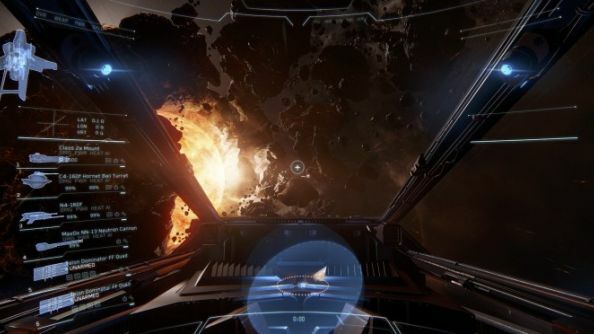 Star Citizen funding has accelerated in recent months, despite the scrutiny the $90.5m project is under.